Major bleeding can be a serious and life-threatening condition and, depending upon the severity, may require immediate medical attention. Bleeding can come from three different sources: an artery, a vein, or a capillary. Arterial bleeding is the most serious type of bleeding. It is characterized by spurts of blood with each beat of the heart. It is bright red in color and is usually severe and hard to control. This requires IMMEDIATE ATTENTION! Venus bleeding is a more steady flow of darker blood and is more easy to control. Capillary bleeding is usually slow and oozing. It generally has a higher risk of infection than the other types. First Aid should be given for bleeding in order to: 1) Stop the bleeding, 2) Prevent infection, and 3) Prevent shock. Apply DIRECT PRESSURE to the wound. Use a dressing (such as a gauze pad) if available. If a dressing is not available, use a rag, towel, piece of clothing, or even just your hand*. Once you have applied pressure, KEEP IT IN PLACE. Even if the dressing becomes soaked with blood, apply a new dressing on top of the original one. Do not remove the original dressing. The less a wound is disturbed, the easier it will be to stop the bleeding. If the bleeding continues and you do not suspect a fracture, ELEVATE the wound above the level of the heart and continue to apply direct pressure. If the wound still continues to bleed, apply PRESSURE AT A PRESSURE POINT. Wounds on the arms or hands can use pressure points at the wrist (radial artery- where you would check your pulse) or on the inside of the upper arm (brachial artery- just down from the armpit). Wounds on the legs can use pressure points at the crease in the groin (femoral artery- where the leg and pelvis meet) or at the back of the knee (popliteal artery). Note that you should still continue to apply direct pressure and elevate the wound while performing this step. The last thing to do is to apply a PRESSURE BANDAGE over the wound. This is something such as a roll of gauze that is used to hold a dressing in place. Pressure should be used in applying the bandage, however after applying the bandage, be sure to check the pulse to make sure that the circulation is not interrupted. A slow pulse rate, or bluish fingertips or toes, indicate that the bandage may be impeding circulation. Use a tourniquet (for arm or leg wounds) ONLY AS A LAST RESORT if bleeding cannot be stopped any other way and the situation is life-threatening. There is a significant amount of risk associated with using tourniquets. If not applied correctly (too loosely), a tourniquet can actually make the bleeding worse. On the flip side, a properly applied tourniquet will effectively stop bleeding from an extremity because it stops circulation to the affected limb but this also means that if the tourniquet is left in place too long it may lead to tissue damage due to lack of oxygen. (Note: a tourniquet should ONLY be removed by a rescuer with training.) However, when faced with a worst case scenario, the potential for a loss of limb is outweighed by the loss of life. For a tutorial on how to make a tourniquet, click HERE. *Remember that when faced with the need to control major bleeding, it is not important that the dressings you use are sterile. Use whatever you have at hand and work fast! Have the injured person lie down (if not already doing so). This helps with elevating the wounded site. Remove any visible objects in the wound that are easy to remove. Remove or cut clothing and any jewelry from around the wound. If the wound swells, tight jewelry could affect the blood flow. 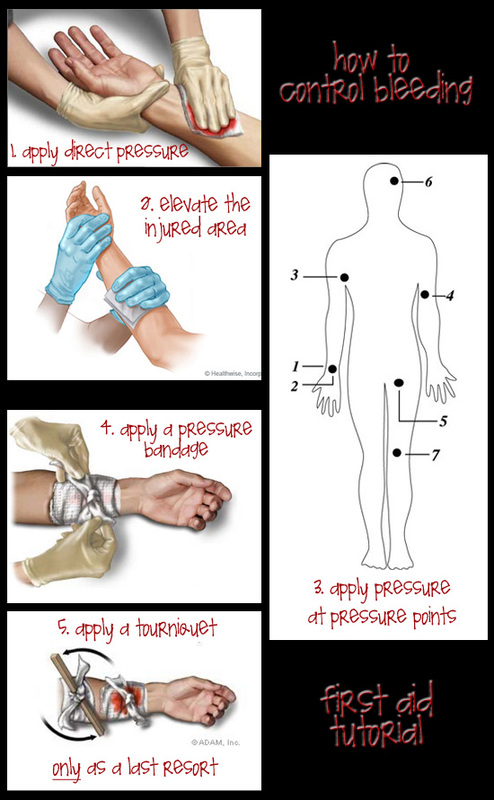 Apply pressure and elevate the wound for at least 15 minutes (use a clock, if available). And just a reminder: This information is for tutorial purposes only and does not replace the need for actual first aid training. I still have my goal for this year to become CPR/First Aid certified and I hope you’re working toward that too. Take care and be safe! Disclaimer: Under no condition will I be held responsible for any consequences of use of this information. This information is meant as a tutorial, or study aid, and is NOT a first aid manual. Introduction and Word of Advice: The First Aid information presented in this post and following first aid posts largely comes from a wonderful and helpful site called Survival Center. The information has been provided by someone who is a Certified First Aid Instructor with many years experience teaching first aid, CPR, and basic life support courses. That being said, this information is NOT meant to be a substitute for formalized first aid training. It is strongly recommended that if you are interested in learning first aid, you look into first aid and CPR courses offered through community groups and organizations. 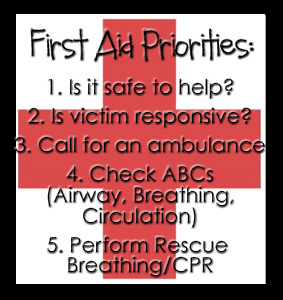 Also, since the use of first aid skills is only needed from time to time, it is a good idea to review this content on a regular basis so that you don’t forget the valuable information. And a big thank you to Captain Dave and Remo P.J. Tilanus for sharing this information with the rest of us! In EVERY emergency situation, there is a logical order to be followed. First, it is important to carefully assess the scene of an emergency BEFORE any further steps are taken. The purpose of this assessment is to assure it is safe to provide first aid care. For example, an unconscious victim might be lying on a live power line. If a rescuer were to touch the victim before the power could be shut off, the rescuer would become a victim as well! Always be sure it is safe before you attempt to help a victim! Once you determine it is safe for you to help a victim, you should immediately determine if the victim has any life threatening conditions. Begin by checking to see if the victim is responsive. Kneel and ask, ” ARE YOU OK?” If there is no response, you must immediately summon an ambulance! Recent studies have conclusively shown that victims who are not breathing and do not have a heartbeat have a substantially greater chance for survival if they receive prompt advanced medical care in a hospital or by trained paramedics. Only after a call is placed for emergency medical services does a volunteer attempt to further help an unconscious victim. If there are bystanders on the scene, summon someone to your side to provide assistance. If the victim is on his stomach, first place the victim’s arm closest to you above his head. Then turn him over by placing one hand on the victim’s hip and the other hand at the victim’s shoulder. Turn the body in a smooth, even straight line so as to not cause further injury in the event of existing spinal cord injury. With the victim now on his back, OPEN THE VICTIM’S AIRWAY by placing the heel of your hand on the victim’s forehead and the tips of your fingers under the bony part of the jaw. Push down on the forehead while lifting up the chin until the jaw is pointing straight up. Now place your ear over the victim’s mouth and LOOK, LISTEN & FEEL for breathing for 3 to 5 seconds. LOOK at the chest to see if it is rising, LISTEN for sounds of breathing and FEEL for air coming from the victim. IF THE VICTIM IS NOT BREATHING, RESCUE BREATHING IS REQUIRED IMMEDIATELY! Rescue breathing will provide vital oxygen to a victim who cannot breath on their own. After giving a victim two breaths, the pulse is checked at the Carotid Artery to ascertain if the victim has a heartbeat. This artery is located on the side of the neck and is found by first positioning the fingers on the victim’s Adam’s Apple, then sliding the fingers down into the soft groove on the side of the neck. The pulse is checked for 5 to 10 seconds. If the victim has a heartbeat, but is not breathing, RESCUE BREATHING is required. If the victim is NOT breathing AND does NOT have a HEARTBEAT, CPR is required without delay! These initial steps of checking the AIRWAY, BREATHING and CIRCULATION (pulse), together with a check for major BLEEDING, constitute THE PRIMARY SURVEY, which looks for life-threatening conditions! In every instance where first aid is to be provided, it is important to always ask a conscious victim for permission to help them. If a victim is unconscious, it is presumed they have provided consent for you to assist them. Please do not forget that this information does NOT replace formal training and does NOT make you certified in first aid. It is simply provided in the hopes that you can make an emergency situation better instead of worse.